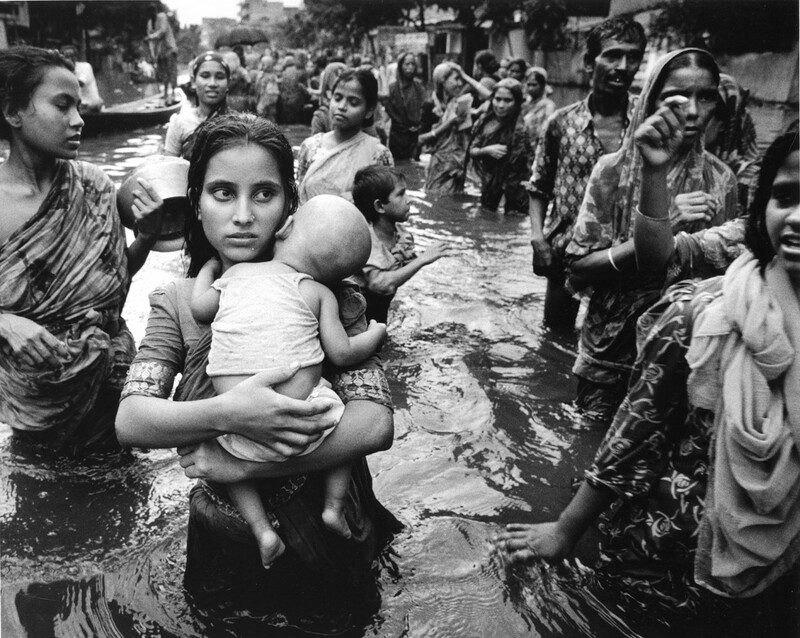 A girl wades through the Dhakar slum of Khilgaon. The stagnant water has been trapped here for several weeks at depths of up to six feet. The Bosila area of Dhakar was severely affected by the ﬂoods. 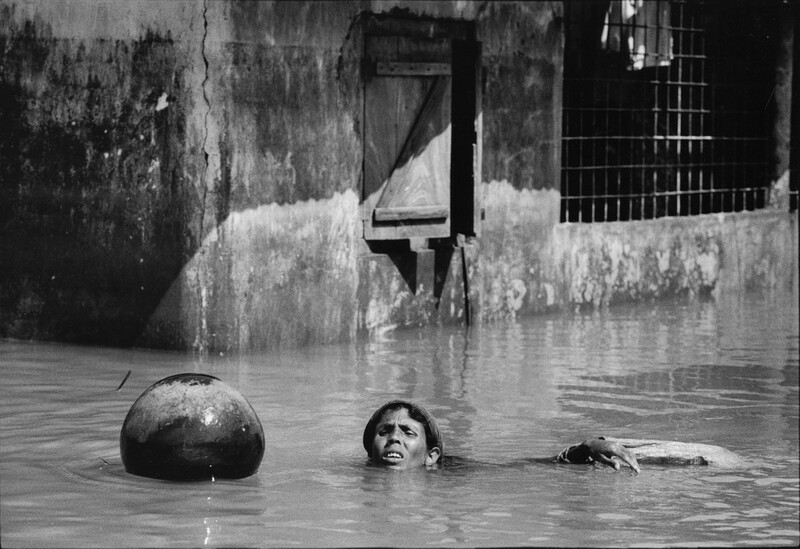 Here a woman swims with her water pot to get water from a tube well on higher ground. ln Dhakar’s Slum Number 4, dykes and dams built to protect the city from floods have trapped the city’s rainwater - Slum no. 4 has been flooded from within. People walk along a make-shift bamboo walkway at roof-top level. ln Dhakar’s Slum Number 4 local volunteers brings roti bread to help the flooded slum dwellers. 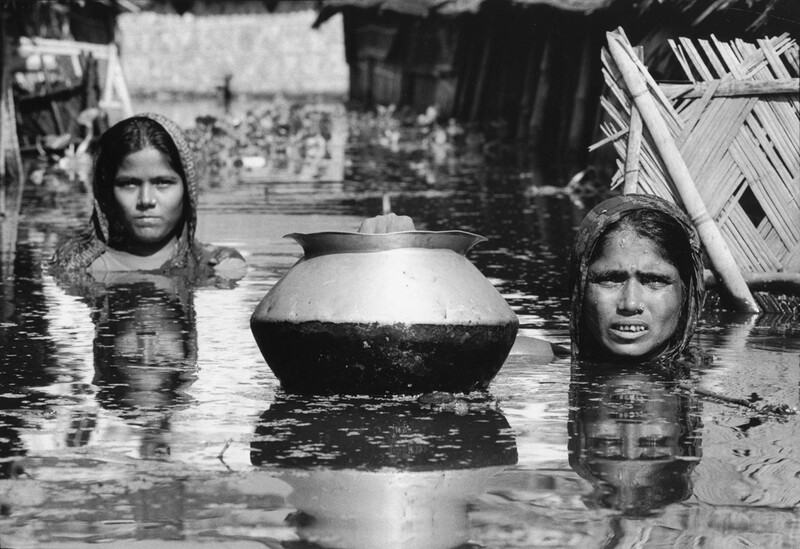 Mother and daughter in the flooded street outside their house in the Dhakar slum of Khilgaon. Stagnant water has been trapped here for several weeks at depths of over six feet. 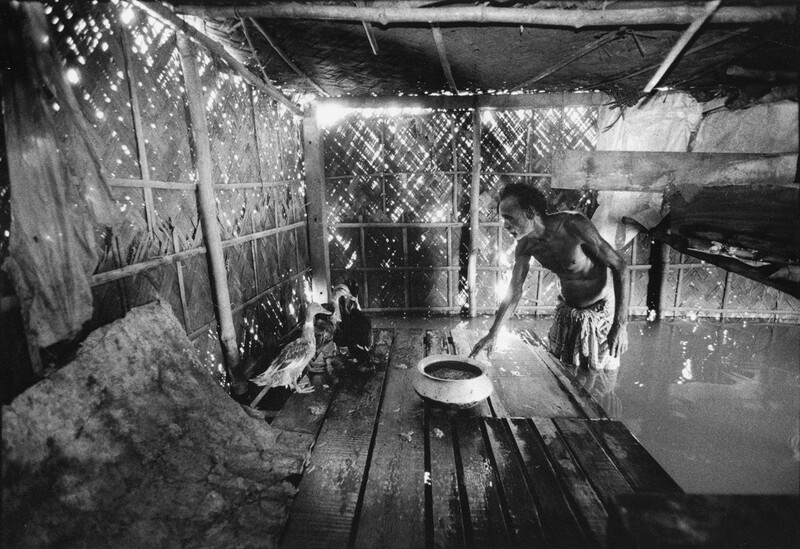 They survive on the roof of their house with minimal supplies from aid agencies. 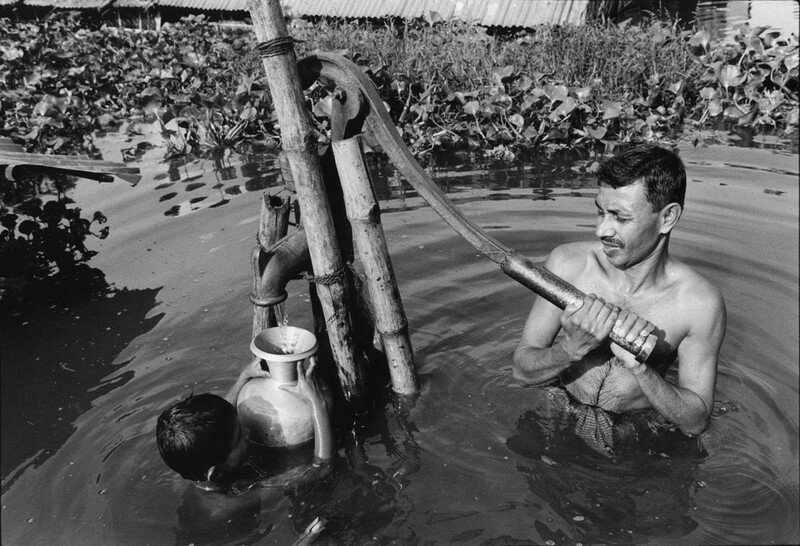 A father and son draw fresh water from one of the few pumps in Slum No 4 not submerged by floods. 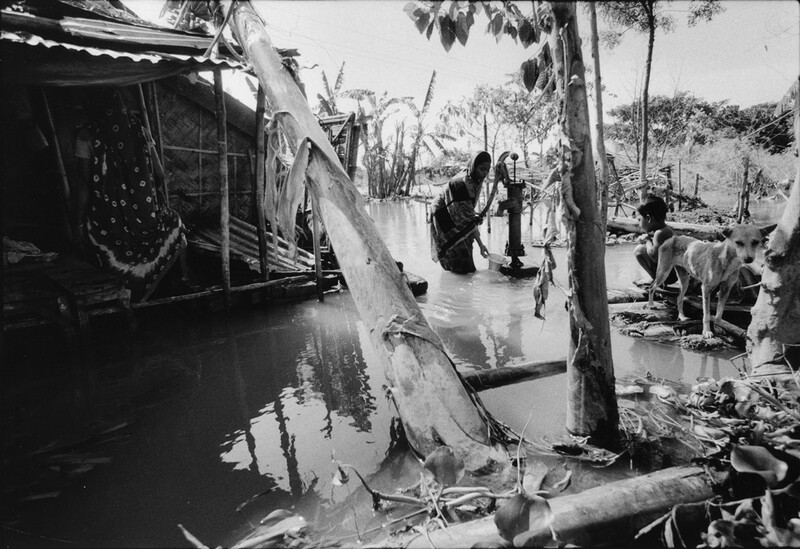 In the southern region near Madaripur, towns and villages were badly affected. 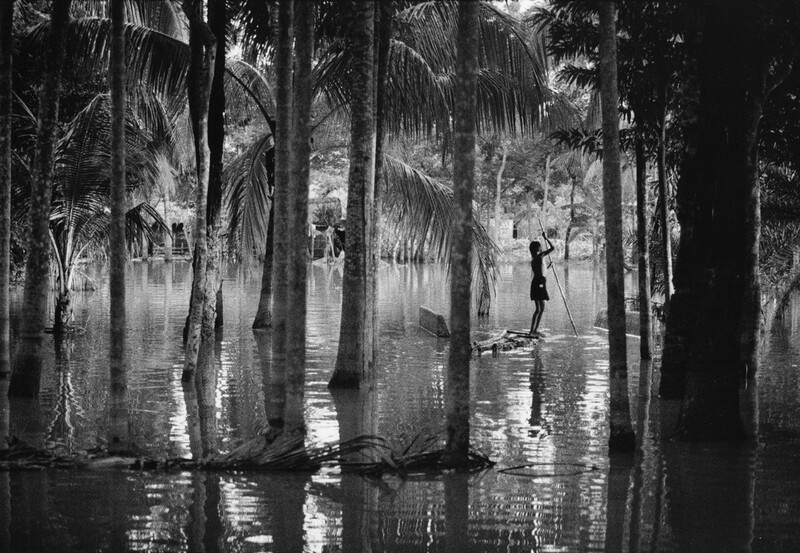 A boy punts across a flooded field on a raft made from banana tree trunks lashed together. 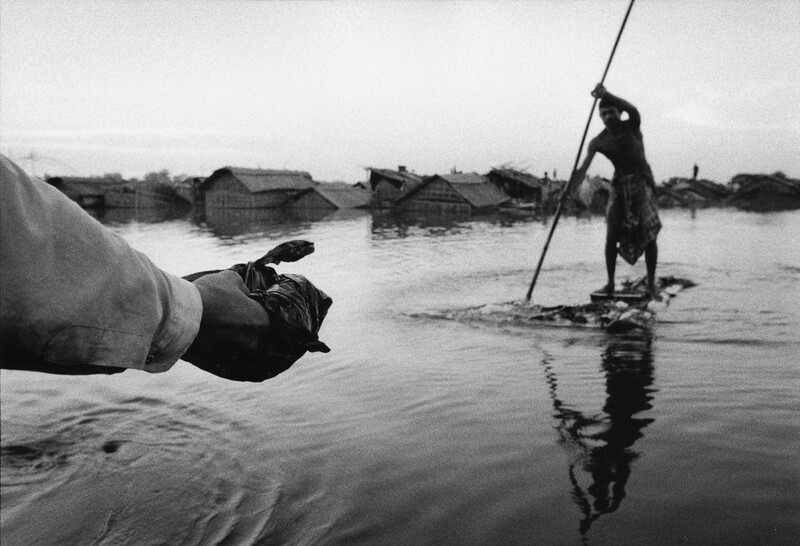 A man stands in his doorway washing himself in the stagnant flood waters in Dakhar’s Slum no. 4. 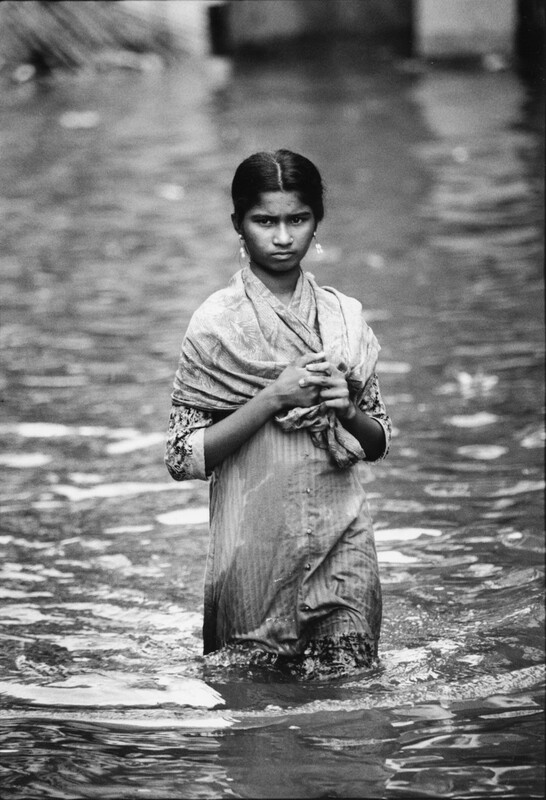 Women wade though water in the Dhakar slum of Khilgaon. The water has been trapped there at depths of up to six feet for several weeks. Here women ask people passing by boat for help. 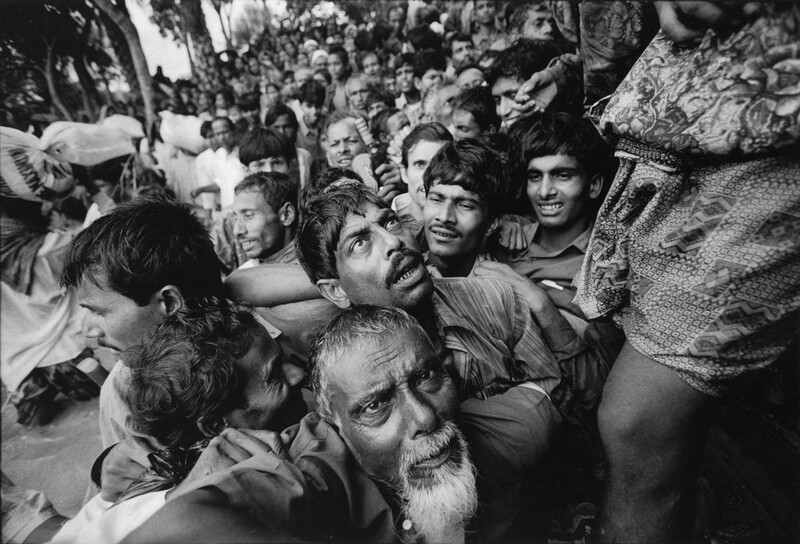 People in a community near Madaripur struggle to get food aid distributed by Care through a local NGO. The Bosila area of the Dhakar was severly affected by the floods. Here a man who is sheltering on a roof nearby has waded into his locked up house to feed his ducks. In the Bosila area of Dhakar a young mother draws water from her household’s tube well. Parts of Dhakar protected from floods by the city’s dykes are not without problems. This area has no fresh water and the only supplies of water are brought in tankers run by a local NGO. Here people are able to wash for the first time in several days. 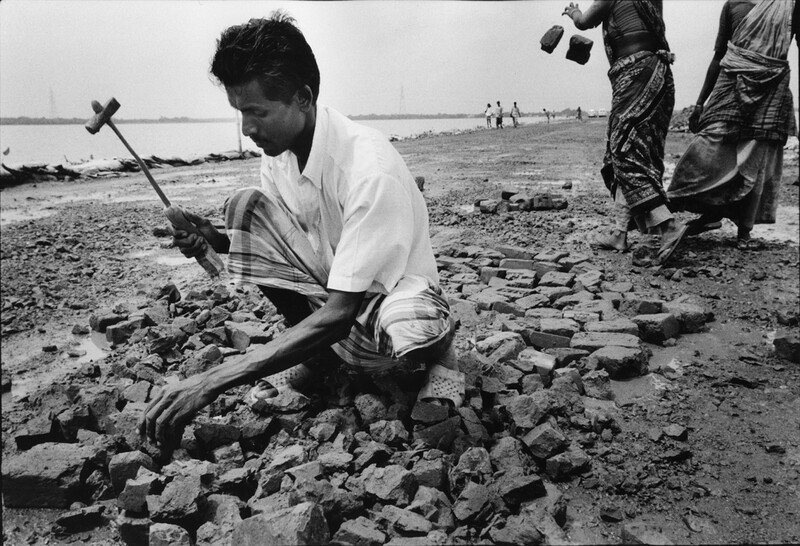 In the southern region communities near Madaripur were badly affected. 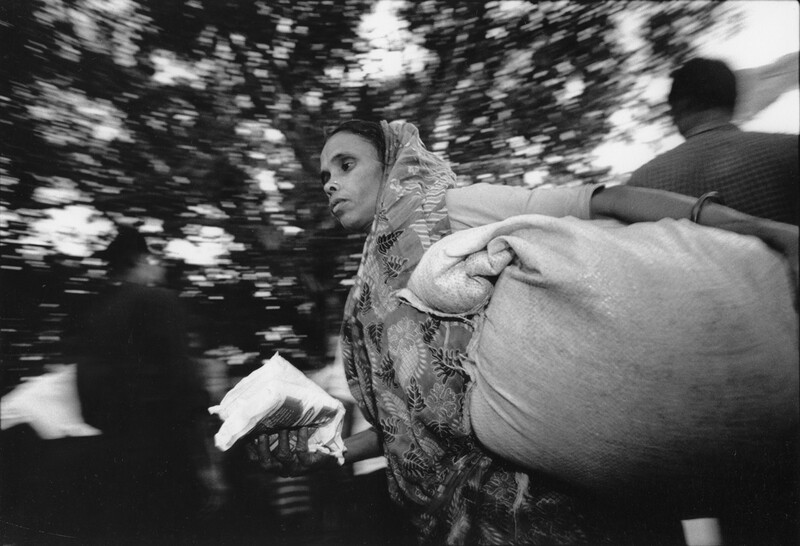 Here a woman walks away from a food distribution with supplies that will keep her family going for several days. 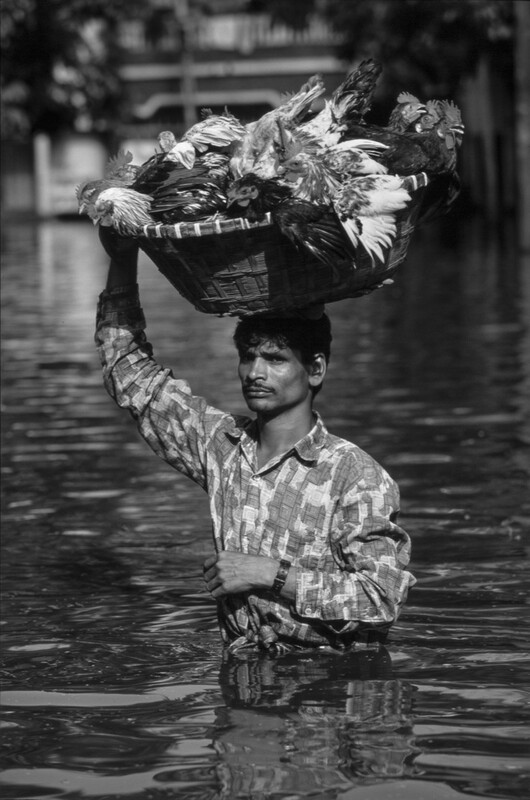 A trader walks through Dakhar's flooded streets to sell his chickens door to door. People in a community in the south of the country near Madaripur hold on to their registration cards as they struggle to get food aid. 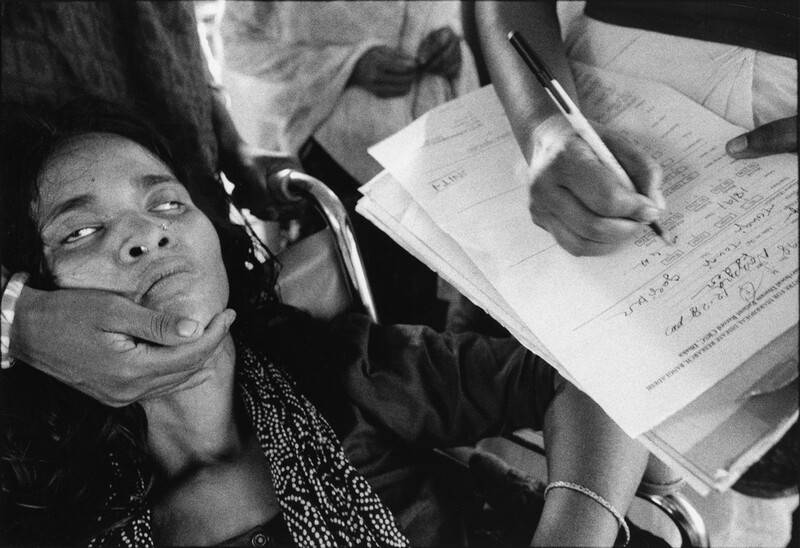 At Dahakar’s ICCDRB hospital for diarrhoeal diseases, over 700 patients were being admitted each day. There was no time to find out if their problem was dysentery or cholera, but an IV drip would cure most of them in hours. Here a flood victim, collapsed through dehydration is registered. Parts of Dhakar protected from the floods by the city’s dykes were not without problems. This area has no fresh water and the only supplies of water are brought in tankers run by a local NGO. 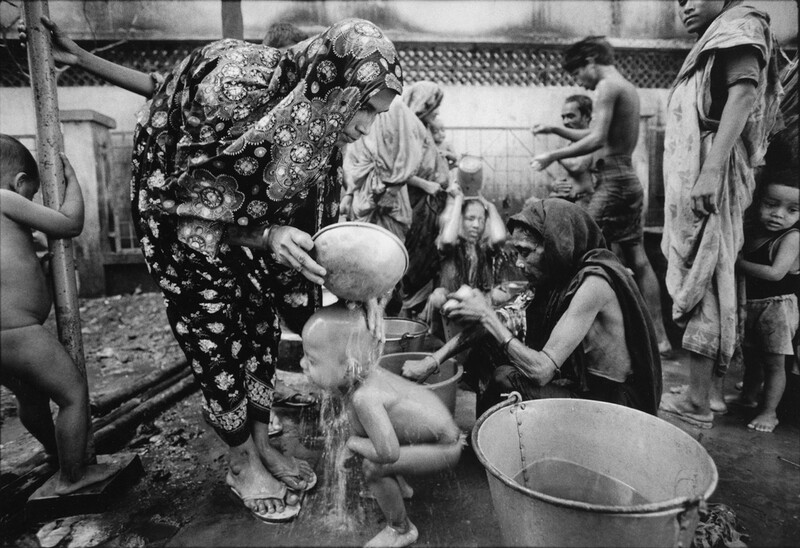 Here a girl carries water to her mother for cooking. 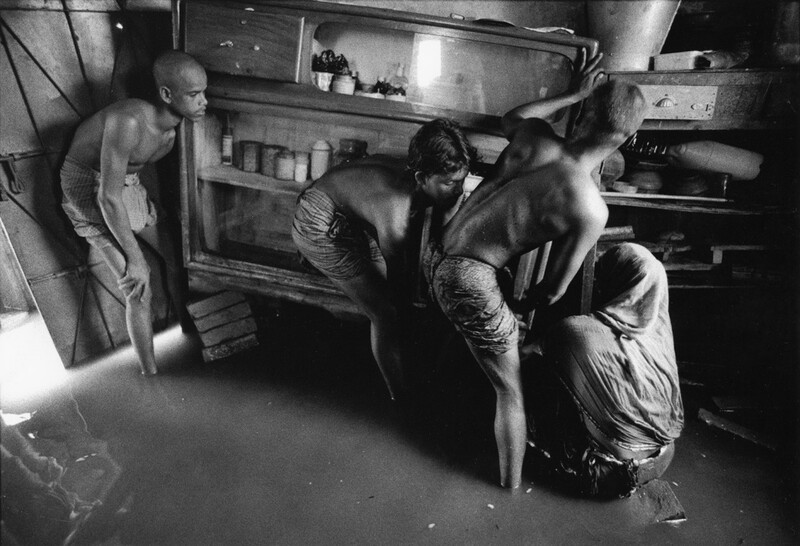 In the Bosila area of Dhaka severely affected by floods a family, who had raised all their furniture on bricks as the flood waters rose, begin to remove them as the water levels finally drop. As the ﬂood waters started to recede road repairs were quickly underway, filling in the damage caused by the floods with broken bricks. 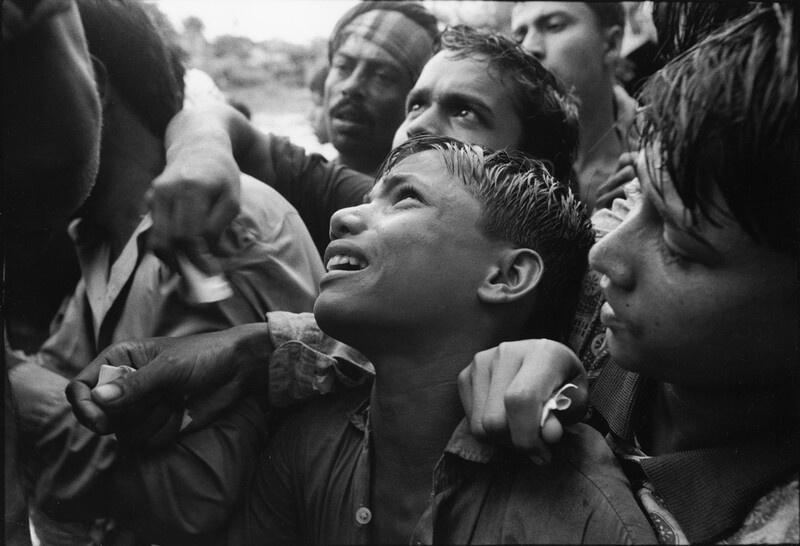 In 1998 the monsoon brought more than its usual amount of chaos to the Ganges Delta. The rains combined with El Nino to bring about the worst ﬂoods in living memory. Environmental degradation also played a part – deforestation of the Himalayan foothills hundreds of miles away meant that rain was not retained by the soil and water flow directly to the rivers. Normally, the ﬂoods last four or five weeks, this year they went on for over ten weeks. 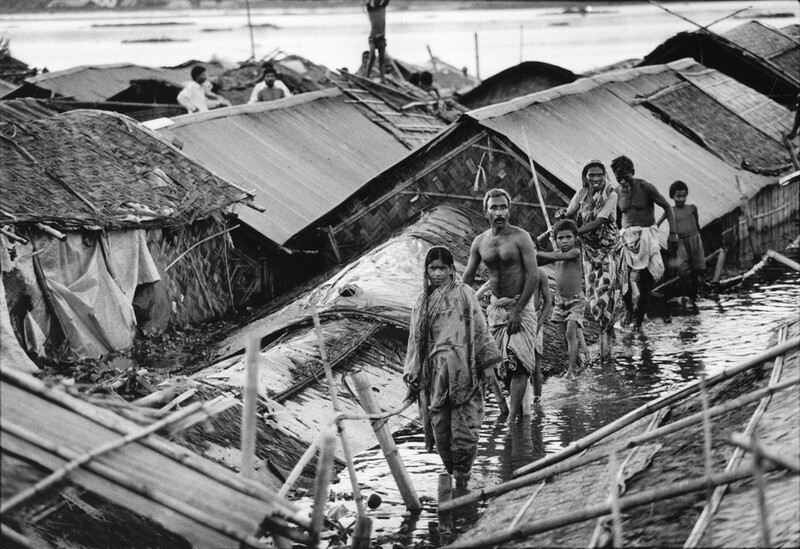 Two thirds of Bangladesh was under water with over twenty million people forced out of their homes, hundreds dead. 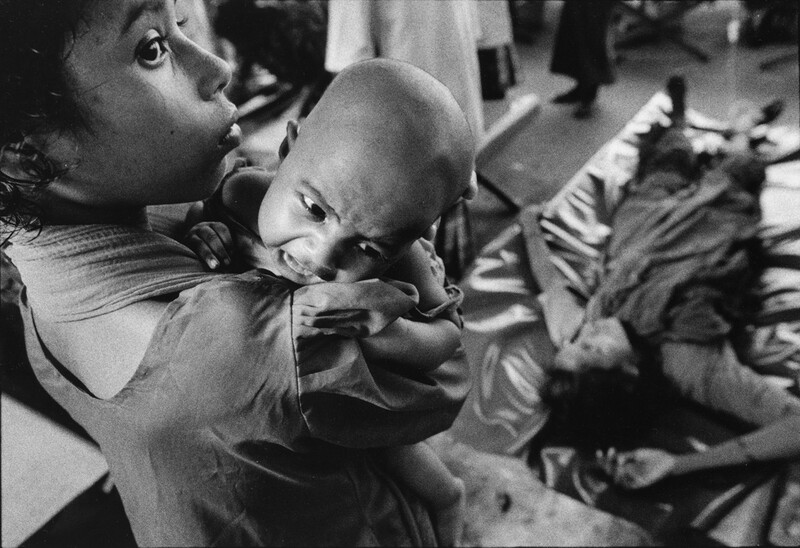 As the waters began to recede, people faced the nightmare of water borne diseases; cholera and diarrhoea would kill hundreds more before the disaster is over.